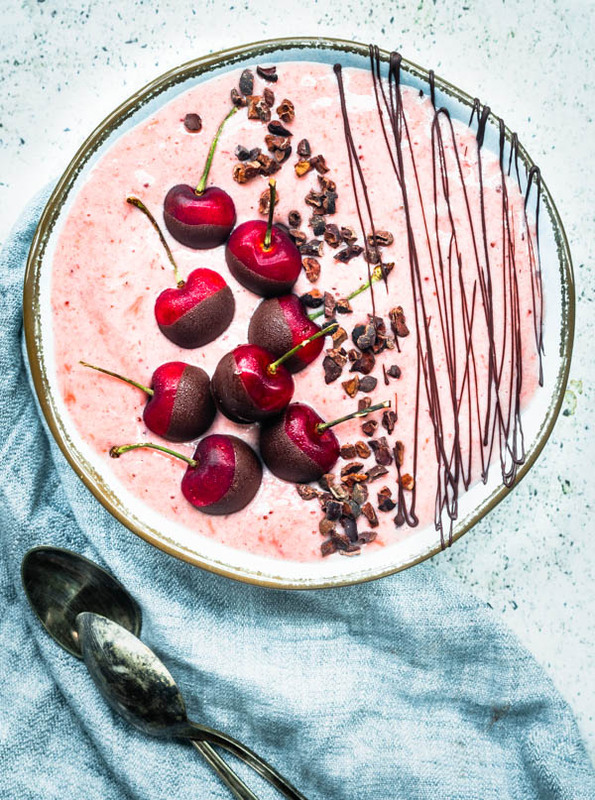 Today I made this Chocolate Covered Cherry Smoothie Bowl. Let me tell you what happened! Yesterday I got 3 wisdom teeth out. So, I am all about the smoothies at the moment. And ice cream! Luckily, I have some of my Vanilla Bean ice cream from when I made these delicious Strawberry Rhubarb Galettes earlier this week. And I made some stovetop Mac and cheese for lunch. So let’s just say I’m eating pretty well. This morning, I needed a delicious smoothie. So this is what I made. Besides eating delicious food, I also enjoyed a very nice and relaxing walk down my favorite trail in the world with the fam. I love running. It’s a habit I’ve recently restarted. And this trail is the reason why I feel in love with jogging years ago in the first place. 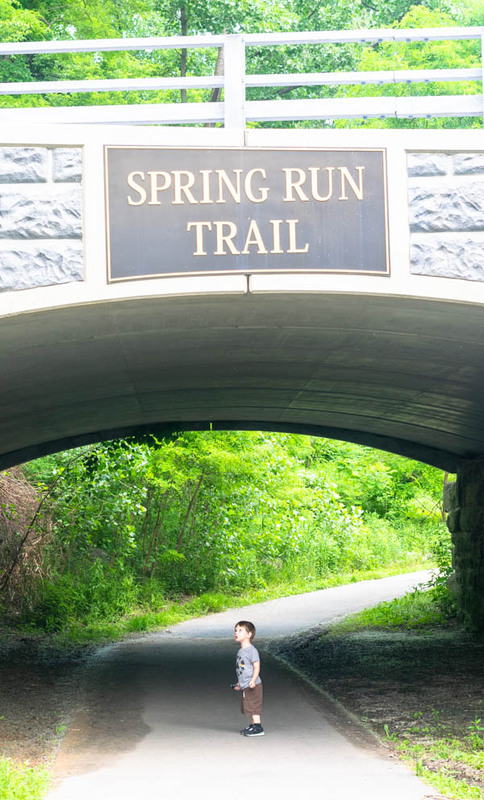 The Spring Run Trail is about 1 mile from our old house in Saratoga Springs. It’s beautiful! I’ve seen deer there twice! And other animals, too! They have a bunch of water around and the ground is perfect for jogging! And this is my son Luke exploring. He is 2. Quite the explorer. The fresh air felt so amazing! We had such a fun walk. Do you have a favorite trail you like to run, or hike? Do tell! I love trails! Anyway, right before our trail walk, I made these Chocolate Covered Cherries. I tempered the chocolate before making these. 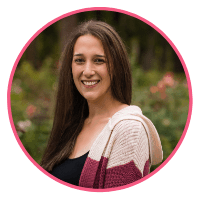 You can skip the whole tempering process if you don’t feel like it. It’s simply an improvement to the quality of your coating. You can use coating chocolate too if you’d like. I don’t usually use them though. I talk about it a bit more tempering chocolate here, if you want to give it a read. And instructions are below in the recipes! If you don’t want to use coating chocolate, or temper your chocolate, simply melt it and go to town! It will be fine too! I used 70% dark chocolate for these Chocolate Covered Cherries. 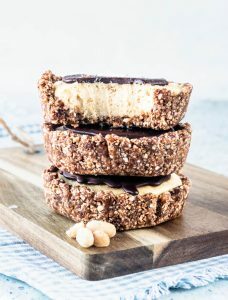 I use Scharffen Berger Baking Bar . Dunk them in. Set them over parchment paper. Let them dry. Go for your walk down the trail. Then you can come back and whip up this delicious smoothie! When I made the chocolate covered cherries, I had some leftover chocolate. So I left it in a bowl. Then, when I was ready to serve my smoothie, I gently re-melted the chocolate and drizzled it on top of the smoothie. It was a nice touch. I should have drizzled double the chocolate!! So good!! This recipe makes for a large bowl. A 2 people kind of bowl, really! I shared mine with my son, Luke. He loves smoothies! He loved eating the chocolate on the outside of the cherries too! Anyway, I hope you liked my bowl! 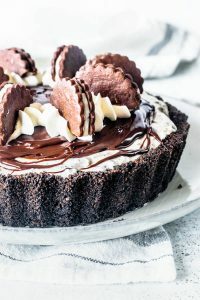 Here are some more recipes that involve chocolate covered stuff! This page contains affiliate links, which means that if you buy any of the products advertised here, Amazon will pay me a small percentage. 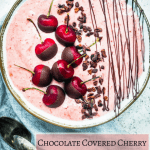 This Chocolate Covered Cherry Smoothie is luscious, delicious, and refreshing. Slightly sweet, tart, with the richness of the dark chocolate, bringing all the delicious flavors together! Let’s start by making our chocolate covered cherries. I decided to temper my chocolate, so my cherries would have a beautiful chocolate coating on them, and the chocolate would snap and be perfectly crunchy when I bit into it! 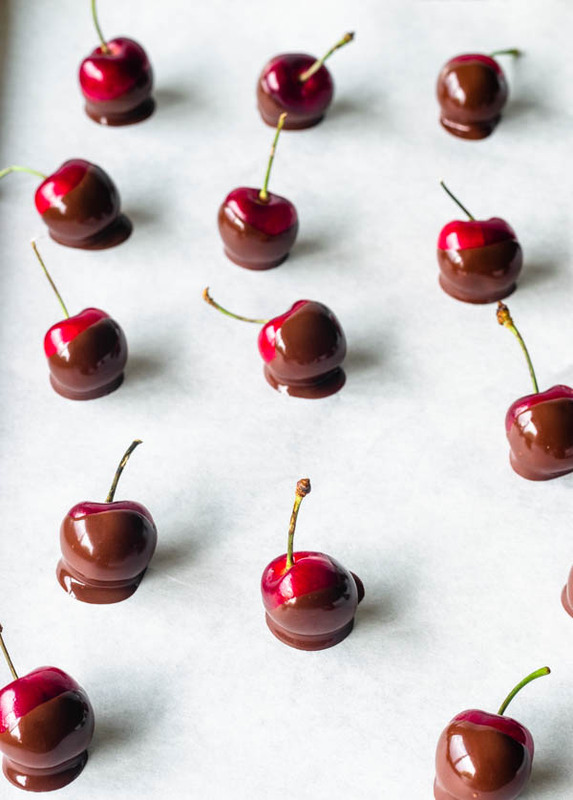 You can definitely just melt the chocolate and coat the cherries, without going through the process of tempering. To temper the chocolate: First, I like to shred my chocolate with a grater. You hear that right. Having the chocolate be in very small and identical pieces, makes it melt evenly. It also makes it easier to control the temperature of the chocolate while tempering. This is a very small amount of chocolate to temper, so might be slightly challenging to control the temperature anyway. First start melting 2/3 of the chocolate in a double boiler. Bring the temperature up to 120F. Add 1/3 of the chocolate to it and mix until combined, and until everything melts. It should reach around 82F temperature. After that, re-heat the chocolate up to 90F. And that’s when it’s in temper. If this whole thing seems too complicated, just melt the dark chocolate, or use some coating chocolate. Melt it and proceed with the next step. Dunk about 2/3 of every cherry in the chocolate. Remove excess by letting it drip. Place on top of a baking tray. Let chocolate set. To make the smoothie, place your bananas and pears in the blender, together with the almond milk, and cherries. Taste and see if you’d like to put sweetener in it. Top with chocolate covered cherries, cacao nibs. There’s gonna be a little leftover of the tempered chocolate, you can drizzle that over the smoothie. 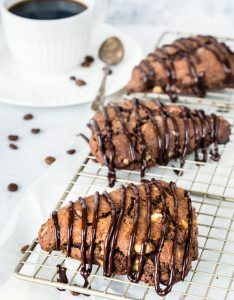 If the chocolate has hardened since then, just slightly re-melt it before you drizzle it. Notes: If you don’t think the smoothie is sweet enough, add a couple tablespoons of maple syrup to it. My bananas were very sweet and so were the cherries, so I skipped the maple syrup. Yum! This looks so good! Cherries and Chocolate are a great combo! This is SUCH a beautiful smoothie bowl! I love how gorgeous smoothie bowls always are, but I just do not have the patience to make them myself — everything in a blender and in a cup for me. I LOVE cherries so I can’t wait to try this in regular smoothie form. Did you say chocolate for breakfast? Pass me the spoon to dive right in! 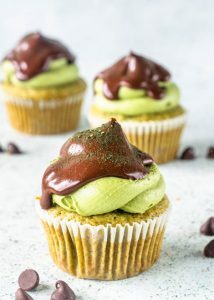 WOW looks so delicious! I love smoothie bowls and always look for different kind of ways to make it. This is gorgeous and perfect for the summer! Thank you Natalie. Smoothies are the best. I remember having my wisdom teeth out and a couple of days of nothing but smoothies afterwards! None looked so pretty as your bowl with the chocolate dipped cherries though! So beautiful! 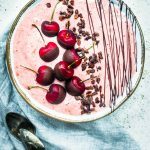 This smoothie bowl is an absolute treat! Not only that I can have this as a great breakfast or lunch! 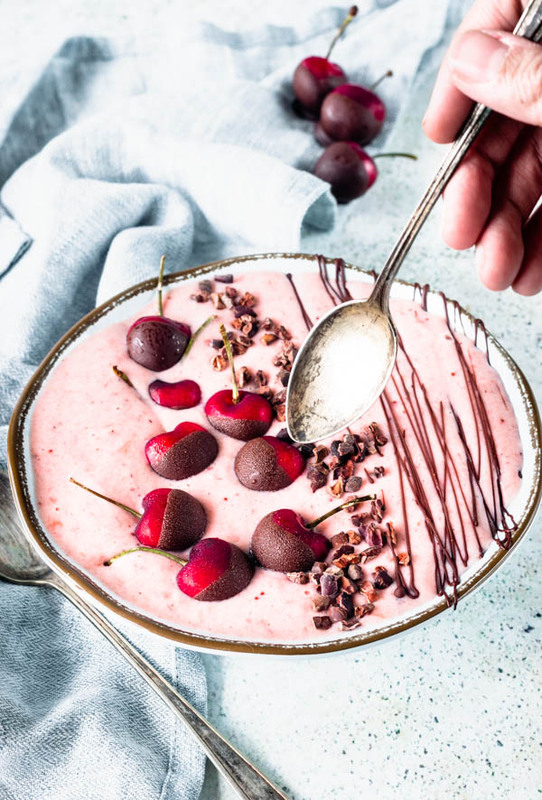 I’m a big fan of smoothie bowls and this one sounds absolutely delicious! I love the combination of chocolate and cherries! I love smoothies and this one looks delicious. I think I’d probably serve in a glass, I’ve never got my head around eating smoothies from a bowl, so I’d need to think it down a touch, but would use your flavours, which look so lovely. Yeah I understand, just prefer mine runny, but love your flavours so will try!